The West is synonemous with freedom, horses and the cowboys that rode them. Modern cowboys still follow the rancher tradition of raising horses, but remembering all those different breeds can sometimes be confusing. This Collage Of Horses - Posters For Cowboys simplifies that. With 19 different types of horses listed in detail, you will quickly become an expert about horses or caballos(in spanish). 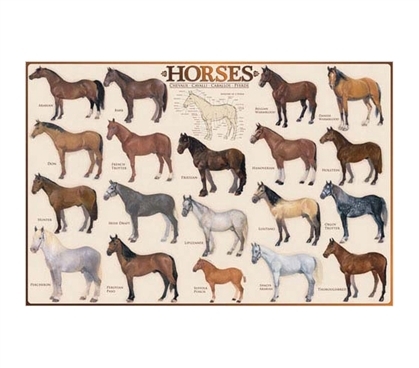 Horse lovers, nature admirers and college students interested in veternarian study would love this dorm room wall accessory for decorating their boring dorm room wall. Get a wall poster that will stick out amongst all those too common ones. Fashionable dorm wall decor is always in stock at DormCo. Snag up a few of these equestrian treats for your friends and yourself.